What are the deadliest drugs in the United States? Which drugs are actually killing Americans? 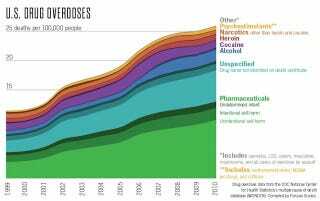 Popular Science combed through overdose statistics from the CDC and turned the numbers into an infographic. Death reporting in the U.S. requires an underlying cause—the event or disease that lead to the death. This chart represents all those listed in the CDC database as “accidental poisoning,” “intentional self-poisoning,” “assault by drugs,” and “poisoning with undetermined intent.” In addition to the underlying cause, a death certificate has space for up to 20 additional causes. That’s where “cocaine” or “antidepressants” would show up. The subcategories are limited in their detail—many drugs are lumped together, like MDMA and caffeine, which are listed together as “psychostimulants.” And about a quarter of all overdose death certificates don’t have the toxicity test results listed at all, landing them in the “unspecified” stripe. There's lots to take away from this graph. The imposing rise in the rate of reported overdoses, for example, the prevalence of prescription painkillers, or the conspicuous absence of pot. Visit PopSci for more analysis. This infographic is just one installment in the magazine's ongoing series on the science, technology and future of drugs and drug-use.